As an epigraph I used loosely translated closing verses of Moydodyr – the poem for children by Russian poet Korney Chukovsky published in 1923. Moydodyr (Wash’em’clean) is an anthropomorphic washstand, a self-proclaimed commander of other washstands and sponges, who teaches an untidy boy (and the readers) “the virtue of hygiene“. I doubt that in my childhood there were too many kids who didn’t read that poem or watched the cartoon. As Wikipedia correctly states, “Moydodyr character became a symbol of cleanliness.” But I must say that for the country, several generations of which grew up on this poem, we were quite unwashed masses. I’ll spare you horror stories about hygiene norms and routines from those times: hopefully, many of those are left in the past. But I want to share some of the less detestable but rather peculiar memories. Soaps. I don’t know how it was in early 20s when the poem was written, but by 80s books were probably the only source of fragrant soap. 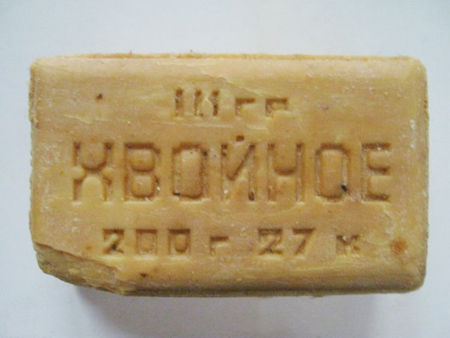 Soap produced in the USSR was mostly functional but not something that would bring joy to any of your senses: usually it was a rectangular bar of some undefined light color and, if you were lucky, a faint unpleasant scent. I suspect that my dislike of natural/organic/handmade soaps has a root in those childhood memories. In today’s economy whenever I read in a product’s description “Imported”, I immediately assume that it’s a euphemism for “Made in China” so in my mind it’s a disparaging attribute: had it been a “respectable” producer, it would have been named specifically – “Made in Germany/France/Italy/the U.S./etc.” Faceless “imported” usually means “a country where labor is cheap and quality is corresponding.” But when I was growing up that property had the opposite effect: it would immediately raise the status of the item. “Imported X” was universally considered of a better quality and more desirable than locally produced X. “Imported shoes”, “imported furniture” and “imported soap” are just a few examples. Usually it didn’t even matter from where those were imported (unless it was perfume, in which case it had to be French). If anybody was lucky enough to get them, those fragrant, perfectly molded and beautifully packaged representatives of remote civilizations “imported” soaps would usually lead a life of leisure surrounded by the finest things… in underwear drawers staying there for years – until finally making a guest appearance in the bathroom. I mean, appearance for some special guests – and only after that fulfilling their utilitarian destiny. The situation with soaps (and other imports) had significantly improved even before I left for the U.S. Camay, Palmolive, Nivea and dozens of other soap bar brands came into our lives and became something mundane and ordinary – just like it should be. And since I haven’t lived there for a long time, I don’t know if the next spiral of craziness (all-natural, artisan and such) has reached them already. But even now and here it’s hard to get rid of old habits: almost three years have passed from the time Rusty and I demonstrated to you the wonderful linden-scented bar until I let the first drop of water touch it. It still smells nice but I think it dried out a little while waiting for its show time. Amouage Dia soap ended up in my stash by chance: there was a closeout sale at the online store and I just couldn’t pass on a great deal. For the last couple of years I was trying to decide when the time would be right to start using it: it’s so luxurious that it felt wasteful to open it without a special occasion. Well… It’s still in its original cellophane. 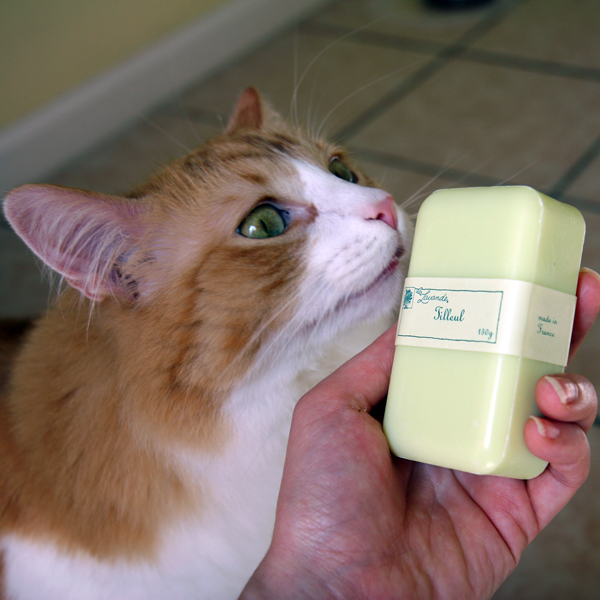 I wanted to see what Rusty thought of the Dia soap’s scent. I’m not positive but does it look to you like he’s trying to show me the proper way of cleaning myself without a soap? 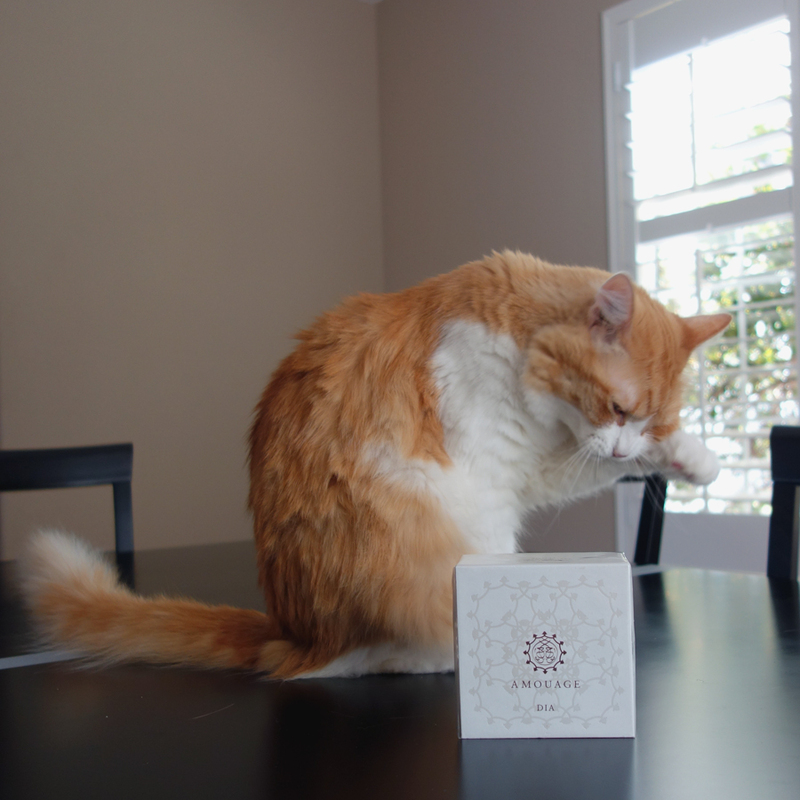 This entry was posted in "Four legs good", Magic Mirror and tagged Amouage, Dia, soap. Bookmark the permalink. What a great post, Undina! I really enjoyed getting a glimpse into what life was like for you back then. LOL at Rusty washing – he knows how to do it without a sud in sight! Rusty manages to stay very clean so he must know a thing or two about washing. Love your post and photographs of Rusty. What a beauty ! What an awful soap and fragrance it must have been for you ! I would open the Amouage Dia soap and use it lavishly. When I was little, friends of my Spanish grandmother used to give me Avon soaps which looked so Beautiful I did not dare to use them. Which might sound a bit odd but they were amazing. I have just started to use soap again, starting with Le Couvent des Mimines. Thank you, Esperessence. Rusty got a treat from you. Le Couvent des Mimines… I’ve never heard of this brand before. I’ll look them up. I want to mention that Avon’s products were considered luxury where I lived when they just appeared in early 90s. Fascinating post, Undina. It left me thinking, “Goodness, the things we take for granted here!” – because I would never have guessed that soap, of all the common items in the world, would be scarce in your native homeland. It seems like such an easy, inexpensive item to manufacture. I’m sure that the topic of common items unavailability in my childhood will keep coming up in different stories. But I’ll mention now one more item that I doubt will find its way into any of the fragrance-related stories. Namely: toilet paper. It was one of the products that people hunted for. And that was how they were carrying the booty. LOL! 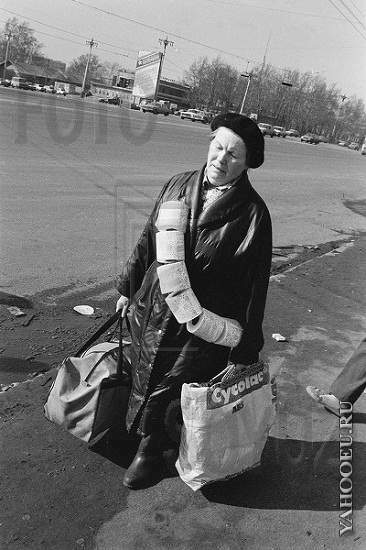 Apparently there was no embarrassment, in those days, in letting the world know you majorly scored some toilet paper! Thanks for the photo, Undina. OMG – i had the exact same thoughts and conversation about ‘imported’ today. So weird that it was the exact same day that you posted this. In some context my mother mentioned that a particular thing was authentic and ‘imported’ and for a minute i was thrown off. After living in the U.S imported has begun to have a negative connotation and I had completely forgotten that when I lived in India – imported was a sign of quality.. Lol. I had forgotten that attribute of the word. So I thought it was a freaky coincidence that you posted the exact same thoughts on the same day. Ok- I already said that didn’t I? 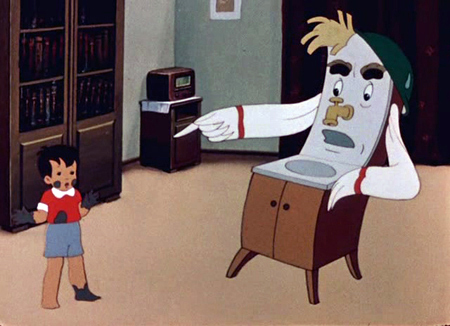 I love the idea of a washstand personified. Amouage soaps after reading Portia’s review but resisted..:-). Nice to see you back online- I remember reading somewhere that you are swamped with work this month. Hope everything’s going well! I suspect that some handmade soaps are good. It’s just the way those bars look is too close to unpleasant memories. And some of the smells are… well… too natural for my liking. I’m still extremely busy (which shows by the number of days it takes me to even respond to comments) but I’m adamant to keep my blog alive: if for nothing else, for the pleasure of the company I have here. Love your post, Undina! I can understand your hesitation to start using Amouage Dia soap… I would. I love soaps and use them daily. I’m about to finish using Atelier Cologne Silver Iris soap and wondering which one I should open next. Wow, if I had such fancy soaps (as Amouage) I don’t know that I’d ever use them – though I realize that that is a shame, because life is short and what’s the point of having nice things if we never use them? There’s never a better time than to make every day special! Wish more people posted about soap. This was fun to read and reminded me of the great pleasure of a scented bar which is sometimes all the perfume you can wear in public places. It’s also nostalgic to read about a time when every school child was reminded firmly to wash.
That poem was written back in times when washing regularly even for adults wasn’t considered the normal behavior (early 20s) and could even be a reason for teasing. Nice post, Undina! I don’t think I have ever consciously looked at where a soap is made except when I am purchasing soap while on vacation outside of the U.S. – e.g. 2013 in Greece, where I bought many soap bars, I checked to make sure I did not end up buying soap made in the U.S.A.
And yes, I think smarty Rusty is miming washing and is nudging to start using that soap already! Back in “old times” one didn’t have to actually “look” – you could have immediately tell if it was a local item or “imported” :) I also always check what I’m buying when I travel – not to bring back “gift from a Far Land” made in the U.S.A. of, even worse, in China. I still have a few soaps collected while traveling India. They smell like pooh, it’s unbelievable and undeniable. I have to keep them in Tupperware because they taint the air of any room they’re in. The most enormous projection and the smell lasts for years. Rusty is a very handsome cat, so debonair, please treat him from us in OZ. I ran out of space in the post but I did think of telling about the absolutely awfully smelling soaps from India that at some point appeared in stores back in my childhood. People started buying them first (“imported goods”!) but then everybody hated them so much that it was one of the rare cases when something “made in ” was openly available in stores. Waves to Rusty, Welcome buddy. Don’t those soaps smell GHASTLY? Ha ha ha. Stomach turning. Hi Undina, Amouage soap, wow! I’m a bit envious. I do love soap. In the UK, TK Maxx ( is it called TJ Maxx in the US?) sells bars and bars of the prettiest posh French/Italian soaps in the type of boxes that look gorgeous on your dressing table. I never buy them, despite the lure. They always dry up. I’m stuck with emollient pump soap that works on people like me who have to wash their hands a million times a day (not because I’m filthy, because I work in a hospital and teach art, the two combined make my hands look 40 years older than the rest of me). Enjoy the Amouage, unwrap the box! I keep picking up those soaps at TJ Max (you’re absolutely right, this is our variation on the name) and place them back: I don’t know those brands and I have a serious doubt in the soaps’ freshness. You need serious moisture therapy for your hands, Sarah! If you find any good hand cream, please share. Interesting post.But do use your luxury soap! I remember some small pieces of soap we would be handed at the public pool had we forgotten to bring our own soap for the shower. Must have been around 1970 or so. It was some kind of boiled soap and the colour was about the same as in your picture! Now of course few people use bar soaps for washing their hair, doing the dishes or cleaning the floor. I still get nostalgic about the “natural soap” with pine scent, but it also means pine scent is not something I usually want in perfume. Interestingly, even thought pine was one of the scents (and the soap on that picture says just that – pine/fir soap), I still like that smell and do not mind it in perfumes. Probably because winter holidays were (and still are) the happiest time in my life. My friend from Latvia loves getting soaps as a gift, now I know why! Love your Rusty! Rusty got a treat for your compliment. Also the boxes from the T.J. Maxx soaps are great for holding perfume samples in your drawer.